With the development of these housing estates and soaring real estate prices, the standard plot size was reduced to 500 square yards. Most of the palatial homes (save those in Gulberg) were evacuee property taken over after partition and because Pakistan of the 1950s through the 80s was a country of single generation riches, the properties began to be divided as the families grew. The homes and gardens of Model Town and Gulberg were progressively cut up into smaller and smaller plots. The tree-shaded bungalows of downtown roads like Temple, Abbott and Davies were demolished to make way for high-rises. Nowhere was an effort made to save so much as a single tree. The house with the garden was no more. Now people lived in blockhouses covering the entire plot save the thin sliver that had to be left unpaved by law. There was no more room for the spreading neem or pipal in the matchbox garden that was now the norm. The 1980s saw PIA air crews bringing home all sorts of exotic plants from the Far East. Though restricted under law, customs officials connived while those of the Plant Protection Department that controls import of exotic species remained spectacularly negligent. The activity went on unchecked, flooding the country with useless species of ornamental flora. This was in tune with the requirements of the new matchbox gardens and ignorant homeowners lapped up the supply. With the diminishing forest cover of Lahore, birdlife began to disappear. Red avadavats, munias, Tickell’s and Paradise flycatchers so common in Gulberg and Shadman were the first to go. Golden orioles, those elusive streaks of black and gold, flashing among the foliage on Davies Road and The Mall were restricted to Canal Bank south of the Punjab University. And this is to name only a few species to permanently migrate away from Lahore. Now, even twenty years before all this started to happen, self-serving foresters had begun to plunder the ecology of Lahore – indeed of the rest of the country as well. Pressured by their political masters to increase forest cover, they went for the one sapling that had a hundred percent survival rate. With help from an Australian botanist, Dr Prior by name, the Forest Department raped Pakistan with six of the six hundred sub-species of the water-guzzling eucalyptus. Since birds and animals kept away from this alien species, it grew where the survival of indigenous saplings was limited to about thirty percent. Consequently, from about 1960 onwards, from Jivani in the south of Balochistan to Chor in the Thar Desert to the mountains of northern Pakistan, only eucalyptus was planted. 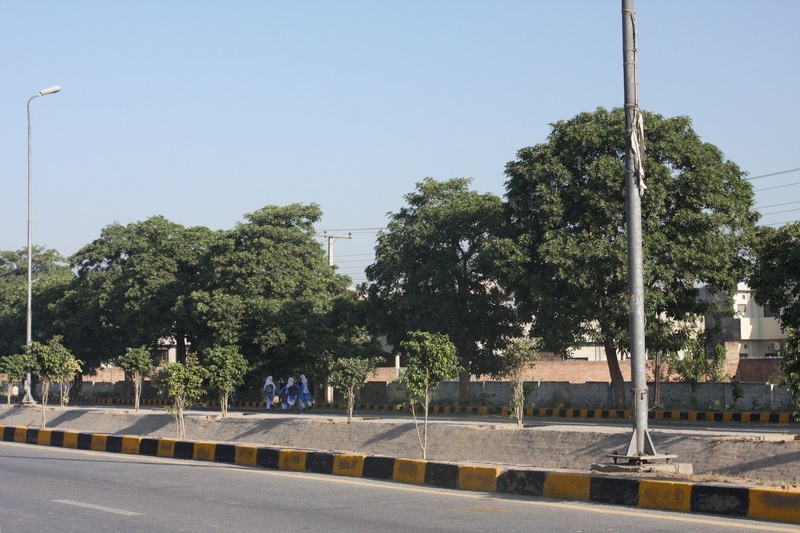 New localities like Township in Lahore where a huge swathe of the historic Lakhi Forest was cleared to make way for roads and housing, was replanted with this new darling of the Forest Department. Simultaneously, there was an aggressive campaign to promote this alien tree. It continued to 2005 when the Punjab government banned its plantation – for the second time. Undaunted rogue Forest Department officials still encourage it. Now, in the past, urban forestry was the responsibility of the Forest Department. In the 1980s Lahore Development Authority (LDA) raised an in-house Parks and Horticulture Department and entrusted it with the task of giving Lahore its green canopy. Since it was managed by ignorant low level bureaucrats, never by a specialist who understood the word ‘ecology’, Lahore now began to be destroyed full time. Wherever an indigenous tree was lost, the replacement was an exotic shrub. In the late 1990s, a self-serving and glib mandarin well-versed in the arts of slick talk and sycophancy, out of favour with the government of the time, already having blighted a part of Lahore with date palms in place of old spreading mango trees, saw his chance. To the Chief Minister, Punjab, he presented the idea of turning Lahore into a garden so that he may be remembered as a second Shah Jehan. And so it was that the department within LDA became a separate Parks and Horticulture Authority under the glib one as its first Director General. The man may have known about flowerbeds, but he hadn’t the faintest clue about ecology. As is the norm in this benighted land, he was followed by a procession of general duty bureaucrats, utterly uneducated in matters of environment, who enacted a sordid game of corruption coupled with the wholesale destruction of the Lahore’s ecology. Now, in a country where the words ‘environment’ and ‘pollution’ continue to remain beyond the comprehension of politicians and the bureaucracy (both civil and military), a holistic understanding of ecology is still wanting. First of all, none of the mandarins who steered the sullied ship of PHA understand that trees are sinks that sequester atmospheric carbon to control global warming. That the larger the bio-mass of a tree the more carbon it will hold is simply beyond their grasp. Consequently, when the tons of bio-mass of a mature banyan or pipal is destroyed, the replacement is a shrub. Those who do favour trees are singularly incapable of understanding that ecology can only be kept in order with indigenous species of flora. Devoid of the capacity to commune with nature, they do not realise that alstonia, another alien to Punjab and now a favourite, is fastidiously shunned by all bird species. Even after years of it becoming a familiar sight in Lahore, not a single alstonia has ever harboured a roosting leave alone a nesting bird. But for the babus of PHA, this is just specie with which to replace the city’s indigenous trees. In 1980 yet another bane struck Lahore. A young man with connections to the dictator through his politician mother became ‘Horticulturist by Appointment to the President.’ Beginning with a free run of the President’s House in Islamabad which he, needless to say, destroyed ecologically, he added another nail to the coffin of Lahore’s ecology. Without any education in the field, the man a landscape artist promoting only exotic species in the city. Needless to say that this was accomplished at considerable fiscal profit to the man. Though he seems to have grown intellectually and has done some good work in a couple of housing estates in south Lahore, he admits that as a landscape designer, his earning comes from promoting expensive and exotic flora. ‘I cannot possibly sell a neem for Rs 1000 when everyone knows they can have it from a good nursery for a couple of rupees,’ he says. He admits that he is guilty, together with PHA, of promoting exotic species to the detriment of indigenous ones for the huge profits to be raked in. Thirty years of brainwashing by persons with no specialised training and no understanding of ecology masquerading as environmental engineers, has led to a near catastrophe. On the one hand, indigenous trees have lost out to exotic ones. On the other, the total carbon-sequestering bio-mass of Lahore is now only a fraction of what it was in, say, 1975. In its twelve years, PHA has remained a den of sleaze and incompetence with only a couple of very short clean interludes. (The sordid tale of PHA and the multi-million rupee-annual hidden income of its incumbents is a separate mind-blowing story). The current director general, another general duty bureaucrat, is choking Lahore with thousands of ficus and the kulfi tree called Asoka. So far as this man is concerned, no other tree exists. The greatest eyesore yet created by this man’s ignorance is the vast open space in front of Allama Iqbal International Airport, Lahore. The list does not end here, however. Choc-a-bloc with all sorts of exotic dwarf palm trees and shrubbery what could have been a delightful sylvan retreat promises to be a shadeless hell in the blistering heat of the Lahori summer. The standard argument trotted out will be that the danger of bird hit precludes the planting of large trees in this spot. This holds no water because the distance between the hundreds of trees in the cantonment and the old runway is about the same as the distance on this side. A PHA insider reveals that working on the Arain clan network, the DG is directly making wholesale procurements of ficus and Asoka from an Arain-owned nursery in Pattoki outside Lahore. The man claims to have cut down on expense by removing the middleman, but allegations about his own fiscal misdemeanour run rife in the corridors of PHA. Despite repeated attempts to contact him, Abdul Jabbar Shaheen remained out of reach, however. Meanwhile, the nursery operated by the Forest Department in Ravi Road, Lahore is a lonely place. With thousands of saplings of over two dozen indigenous species of trees sold for no more than two rupees a piece, the nursery is unknown to the people of Lahore. With freelance landscape (con) artists and pseudo horticulturists promoting all sorts of exotic rubbish in place of the trees of Punjab, a whole new mindset has emerged. A day will come when the children of Lahore will not know what a pipal or a neem looked like. The same way as they today do not know what a firefly is. A retired judge, resident of Judicial Colony in south Lahore, commented on the absence of birdsong in his locality. When told that it was because of the forest of non-local species that grows in his estate, he was nonplussed. Despite being pressed to get the management of the colony to phase out the alien and bring back the indigenous, he has done nothing. He only laments that there is no birdsong. With every prejudice against nature, we have turned Lahore green, but it is a green desert. It is a desert where few birds sing and which does nothing positive for the overall ecology of the city and the country. We have to be thankful that this land was once ruled over by the Brits who planted The Mall, Lawrence Gardens and the cantonment and that there were good Hindu and Sikhs who gave us Model Town. These are the only places in Lahore today where a bird watcher can find woodpeckers and hornbills. The beautiful mating song of the red avadavat, the mellifluous whistle of the golden oriole, the eerie call of the spotted owlet, the incredibly soft yet crowded orchestra of a single chiffchaff are gone. We do not realise, but we are the poorer for the loss of birdsong. One day, we the people of Lahore, will die from this resulting loneliness of the soul in a landscape ravaged by a desert of exotic greenery.